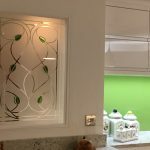 T he Leadbitter Glass Studio supplies bespoke decorative glass panels direct to homes and businesses throughout the UK and around the world. 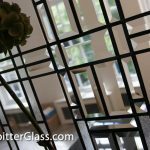 We can manufacture almost any glass design in your specific glass sizes and we create the following types of glass in house – Etched Glass, Bevelled Glass, Overlay Stained Glass and Fused Glass. 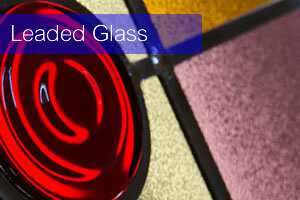 Our glass design gallery is probably the largest decorative glass gallery on the internet. We have well over 1000 designs in our galleries even though many of the orders we receive are for unique and bespoke designs or designs not featured in our vast galleries. 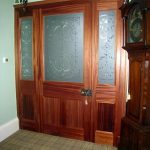 If you are looking for beautiful glass for your door we have hundreds of designs in modern and traditional styles and the best part is, you can see the glass design in the actual door colour of your choice. 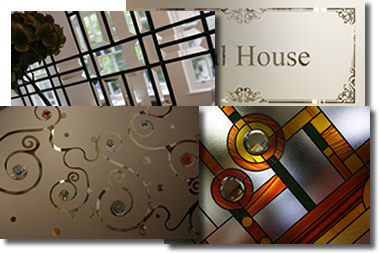 We also have hundreds of designs suitable for feature windows, fanlights above doors, screens or anywhere that you would like decorative glass. View our ‘Client Pages’ section to see some recently placed orders. The Leadbitter Glass Studio has recently received another order from London’s famous bear – Paddington. After the success of the first Paddington movie (which we feel was partly down to the beautiful glass we created for Paddington’s front door) Leadbitter Glass has been asked again to create Overlay Stained Glass panels for the upcoming Paddington 2 movie. 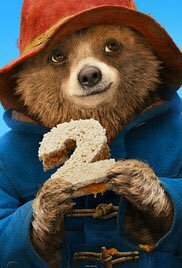 The original blockbuster ‘Paddington’ hit UK cinemas in 2014 and is now on DVD. 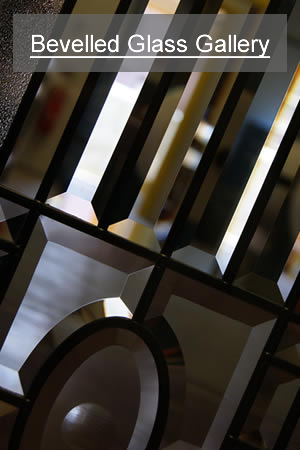 The Leadbitter Glass studio created the Overlay Stained Glass fanlight above the front door of 32 Windsor Gardens – the Brown family home where Paddington lives. We also created matching glass for the ‘nasty neighbour’ Mr Curry at number 34. On the right is a glimpse of the glass we created for the movie and you can see the full article about the original glass we created here. 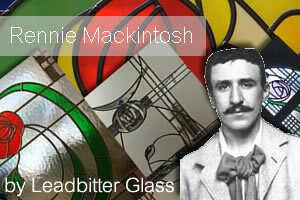 Charles Rennie Mackintosh designs have always been very popular with decorative glass ‘buyers’ and as a specialist studio we receive dozens of requests a year for Mackintosh themed glass panels. On show in our dedicated Mackintosh Gallery is our interpretation of the famous ‘Willow Tea Rooms’ door designed by Mackintosh in the early 20th century. 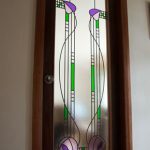 The gallery contains many Rennie Mackintosh inspired designs for windows and doors but we also get a lot of requests from customers wanting us to create designs based on their own personal Mackintosh jewellery or even a kitchen wall tile. Watch a short video showing a few examples of what we can create…. Glass created from your own drawings or photos! 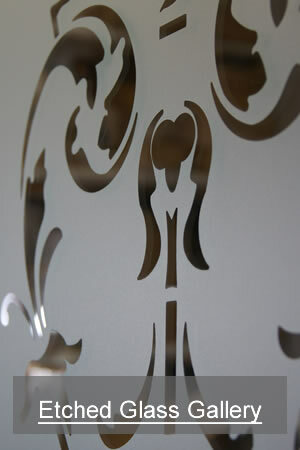 Leadbitter Glass can create bespoke decorative glass panels from your own drawings or even photos. 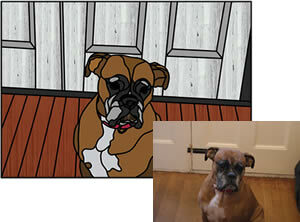 Family members, pets or even homes can be immortalised in a beautiful glass panel. 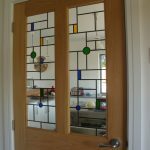 We can create personalised single glazed or double glazed glass panels for your door or feature window in Leaded Glass or Etched Glass depicting your favourite animal, sport or even a country scene. 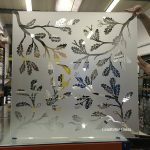 Our glass artists have at least 20 years experience drawing and designing bespoke glass panels and have produced original works of art for projects around the UK since 1994. 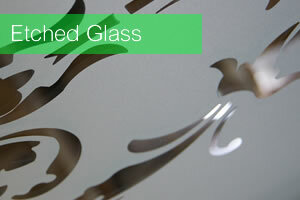 Etched Glass or Sandblasted Glass as it is also known is one of the most popular forms of decorative glass that we manufacture. 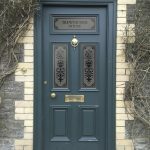 Etched Glass is the ideal form of decorative glass for traditional style doors and also ‘fanlights above doors’ featuring house names or numbers. Modern abstract designs are also a popular choice with customers and when we etch a design onto Satin Glass, the final result is ideal for bathrooms and other areas where the utmost privacy is required. 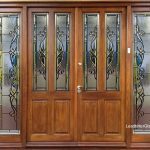 Leaded and Coloured or Overlay Stained Glass as it is also known is not just an old fashioned style of decorative glass, it can also be used to create stunning contemporary glass for doors and windows. 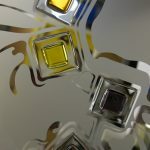 By combining different colours, textures and roundels, we can create stunning glass panels that look amazing but also provide your home with the highest levels of security and insulation. We have more than 5 different types of lead finishes available including soldered lead to enable the panel to look old and traditional and our most popular lead – antique lead. 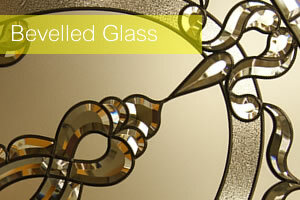 Bevelled Glass designs can truly lift the whole look of a room or door entryway. The way the light bounces off the angled pieces of glass is a beautiful sight that can only really be appreciated when you are face to face with a Bevelled Glass panel. 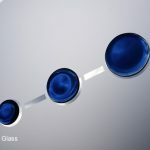 We have hundreds of bevelled glass clusters to choose from and with the addition of single bevelled pieces, the range of design possibilities available is limitless. Bevels can be used along with colours, textures and different lead strips to create unique focal points for your home. 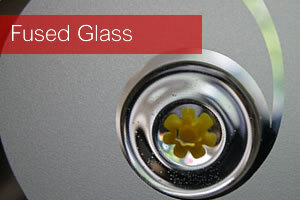 Fused Glass is a true wor k of art captured in glass. 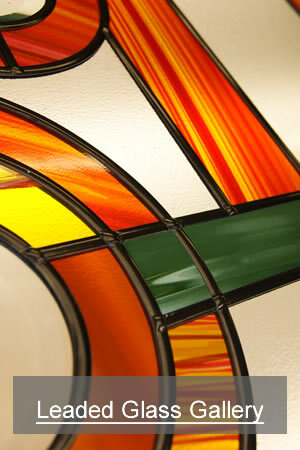 The different coloured areas of the glass are slowly melted together to create a beautiful effect that looks stunning. 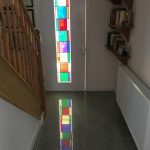 Our fused glass tile gallery contains many different tiles and these can be used to create amazing and unique door and window glass panels. One of the most popular fused glass requests we receive is for our ‘Fused Glass Tree Of Life’ design. 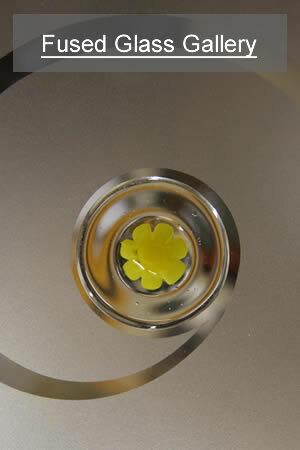 The design is created by sandblasting the background design into the glass with the addition of small round fused glass tiles.